This year has been the most challenging for the marine industry in decades, and more so for the medium segment players serving this industry as Marine Project Consultants, many of whom could not survive the tumultuous times. With great tenacity, foresight, perseverance and able leadership, SeaQuest created a niche and managed not only to survive but also prosper, looking positively to the future. SeaQuest has the pride of taking a leading role in the Naval Ship Construction Supervision, serving the world-class Navies of United Kingdom, Norway and, last added, New Zealand. The latter project consists of Plan Approval and Construction Supervision of one Military Sustainment Capability – Enhanced Naval Ship. 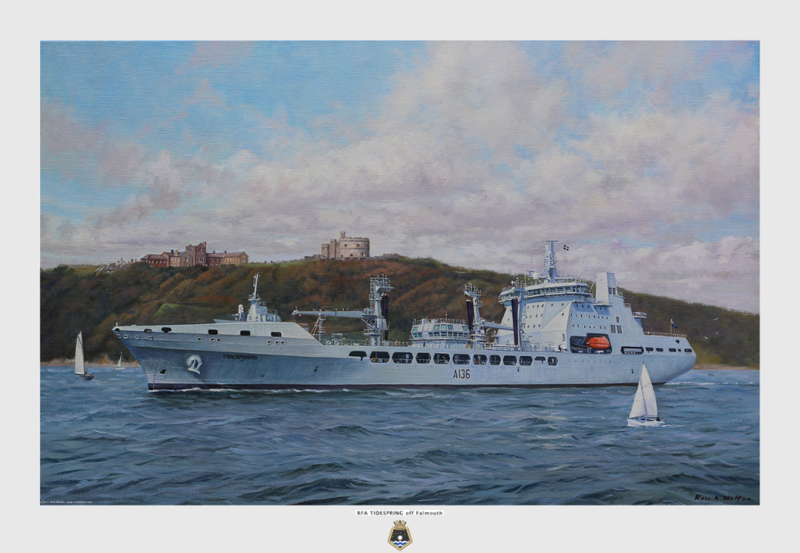 This year we succeeded in delivering three MARS (Military Approach Reach & Sustainability) Tankers for Royal Fleet Auxiliary MoD UK and conducted the Naming Inauguration Ceremony of HNoMS “MAUD” for NDMA Norway. The dedication of the entire SeaQuest team over a period of more than three years has borne fruits for all of us to cherish. This experience puts us on a firm ground in a completely new market segment and has opened fresh vistas for our company. The 1st MARS Tanker “TIDESPRING” delivered in January 2017, successfully conducted RAS trials with two Naval Warships simultaneously and has been inducted in service of the Royal Fleet Auxiliaries. Among the meaningful activities, SeaQuest took up another singular challenge converting a dismal case into an opportunity for the Hyundai Group, for two Suezmax tankers whose contract was annulled by the Owners and taken over by HHI shipyards in S.Korea. In fact, SeaQuest partly conducted the Plan Approval for these Tankers and completely supervised their construction on behalf of HHI, for the first time. Our supervision improved the Tankers quality and trustworthiness in the market as these vessels were successfully sold by HHI to a significantly higher price than the market price, shortly after their construction completion. While this year marked our foray within new market segments unchartered by SeaQuest, we continued with our regular business by successfully delivering Very Large LPG Carriers, Very Large Crude Carriers, Suezmax Tankers and finally, on 22 November, the largest Product Carriers of 157k DWT with fully coated cargo tanks as per PSPC. A very judicious mix of our traditional strength with the new ventures, our hard work, dedication and foresight has been instrumental in steering our company through these difficult times and will take us to the future with hope and prosperity for our company. In 2017, we successfully delivered 12 vessels and till now 12 ships are planned to be delivered in 2018. I would like to take this opportunity to thank all SQ members for the hard work and dedication and wish better prospects in the coming years. Jan Andersson (in the foreground in above photo in occasion of MARS tanker delivery to MoD UK) is SeaQuest co-founder, Managing Director & General Manager. Over the last 25 years, most of which spent in the Far East - he actually resides in Ulsan, S.Korea - Janne has gained a remarkable and possibly unique experience in shipbuilding project management, being in charge of a hundred of qualifying new building projects (his CV is available here). Janne heads SeaQuest technical department, directly coordinates and controls the new building supervision teams and regularly attends at yards and on projects’ key events, providing vital guidance, support and direction for any major and strategic issue which impacts on cost, quality of construction and ship's delivery. Trust and reliability are values that our clients are looking for. This is why SeaQuest was appointed by Hyundai Samho shipyard for the new building supervision of two Suezmax tankers originally contracted by a German owner in 2015, and whose construction was carried on builder’s account in view of putting vessels on the resale market. SQ was selected as independent and renowned party to ensure potential buyers that the construction of the vessels was carried out according to best practice and quality standards. The project was successfully completed in July 2017 and the vessels sold to one of the largest tanker companies (International Seaways Shipmanagement LLC ) with deliveries “ ex-yard prompt”. As pre-announced in December last year, the Protocol of AOC - Acceptance Off Contract was signed for RFA TIDESPRING by Mr. David Farmer - Head of New Building - Ministry of Defence UK and Mr. I.S. Yoon - Director &Head of Naval &Special Ship Business Management Unit - DSME at 11:00 KST on the 12th of January 2017. These highly sophisticated vessels are the result of a successful combination of the most advanced marine technology with efficient and vanguard shipbuilding design, integrating the ultimate developments of military science and marine automation systems. SeaQuest has been engaged in this challenging project since 2013, overseeing the entire construction program, from steel cutting to completion, standing at the forefront together with the Client, MoD UK, and actively participating to each step of the construction process. SeaQuest’s skilled team of marine engineers and naval architects, appropriately selected to fulfil the specific requirements of all involved disciplines, performed the supervision and surveillance jobs under the directives of Mr. Jan Andersson - Managing Director & Project Manager of SeaQuest, during all phases of the construction and testing of the ships, allowing the achievement of outstanding results in terms of ship’s performance and shipboard systems functionality during Factory, Harbour and Sea Acceptance Tests. Despite a certain delay accumulated from the original planning, the signing of the AOC of the first ship of the series represents a great milestone, which was possible to be achieved only thanks to the excellent collaboration and superb co-operation of all involved parties. Therefore, we wish to take this opportunity to thank our Client - MoD UK- with their site team of officers and engineers headed by Capt. Jim Collins - DES Ships CSS Superintendent, and all our industrial partners namely DSME, BMT Group, Lloyd’s Register, Frazer–Nash, Isherwoods and A&P for their great support during the construction of this “piece of high-tech”- RFA TIDESPRING. We are honored to have taken part in this grandiose new building program and are extremely proud to be associated with this majestic accomplishment, wishing all the best also for the remaining ships of the series and looking forward to consolidating our business partnerships with MoD UK for the years to come. 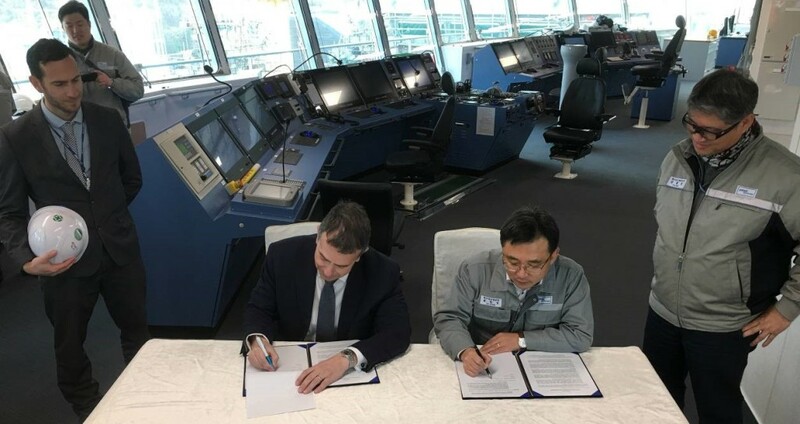 David Farmer (Head of New Building, Ministry of Defence) and IS Yoon (Director & Head of Naval & Special Ship Business Management Unit, DSME) signing the Acceptance off Contract on the bridge of RFA Tidespring.